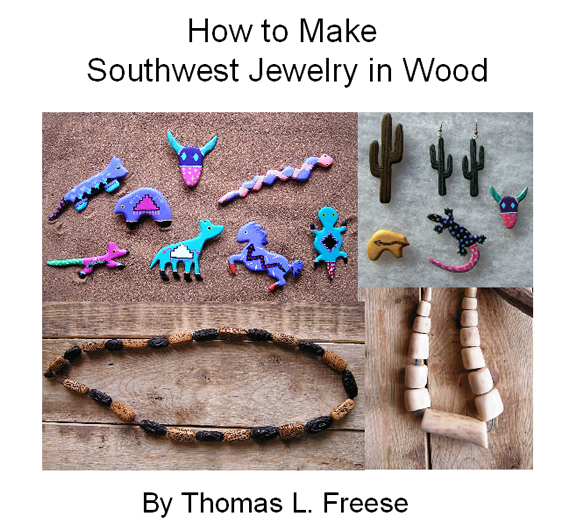 Thomas Freese created a line of wooden jewelry in the late 1980s. This book details how anyone can create lovely jewelry, pins and earrings, from thin wood. Packed with other a hundred color photographs, Thomas takes the reader step by step through the process of design, creating tracing forms, tracing and cutting, sanding and finishing wood jewelry. In addition he explains how to wood burn or paint designs onto natural woods or craft plywood’s. He reviews safety issues, marketing and the tools needed to make jewelry.